Though embodied practices that center on African Diasporic (Black) body technologies of reasoning in and through ecstatic joy, Critical JoyJ/Ecstatic Reasoning workshops are explorations and examinations of embodied techniques for accessing joy and innovative reasoning that are potentially resurrective. In CJ/ER workshops the body’s abilities are directed to manufacture (real and/or imagined) spaces/place for reconstruction, reconfiguration, and realignment of self-to-self, self-to-community, and self-to-divine. CJ/ER workshop participants will be guided through techniques and experience processes for igniting Critical Joy/Ecstatic Reasoning into daily life, and discovery and re/imagine inner embodied resources for navigating through and making sense of life in a problematic world. The making of Carmen Montana, a choreoplay based on the true story of an adult literacy student. In this video, Joanne Kilgour Dowdy, PhD questions Carol Marie Webster – director/choreographer, about the creative process. Shadows of Flames, 2005, is an exploration humanity’s encounter with fire, broadly conceived. The United Nations’ (UN) General Assembly declared the year 2011 to be the International Year for People of African Descent. Conceived by Carol Marie Webster in Celebration of 2011 Black History Month Mother Libation was an evening of original stories about mothers and grandmothers of Africa and the African Diaspora. 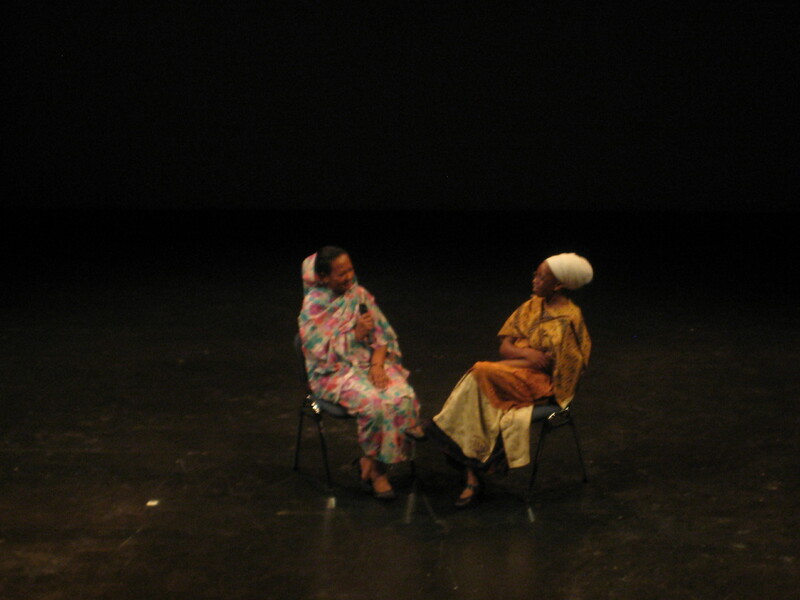 Above pictured are Ameena Al-Rasheed sharing stories from her Sudanese grandmother and Carol Marie Webster asking questions about the cultural, social, and historical context of Al-Rasheed’s grandmother’s time. Offering journeys of joy, laughter, struggles, and triumphs, six women and men share the personal histories of women who though their extraordinarily ordinary lives and life philosophies fortified families and communities. Contributing writers and performers were Ameena Al-Rasheed, Ronald Cummings, Nalini Mohabir, Shirley Anne Tate and Carol Marie Webster. Stories from the Sudan, Jamaica, New York City, Florida, Trinidad, Canada, and the United Kingdom were shared. 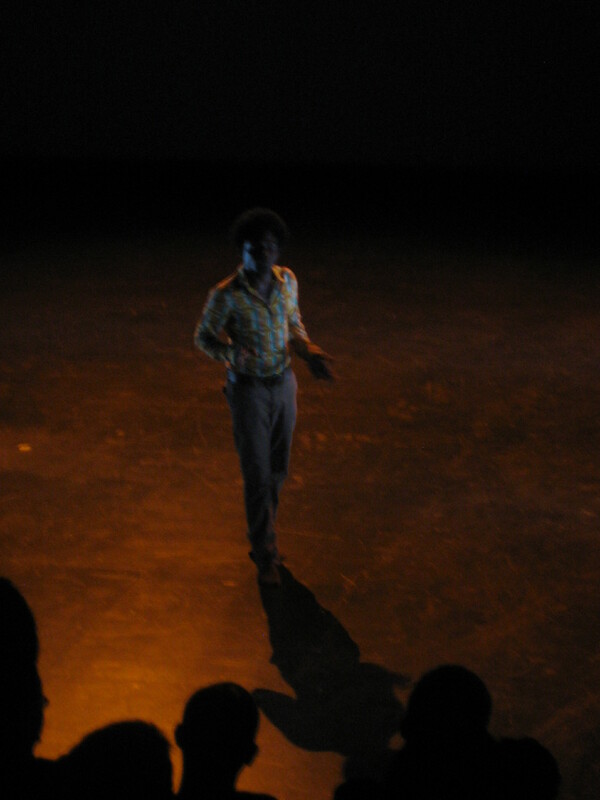 Mother Libation was performed at Stage@Leeds at the University of Leeds on 3 October 2011. Mother Libation’s Artist-Audience discussion session was an essential component of the evening’s experience. For more than thirty minutes audience members shared their own stories of mothers and grandmothers who constructively troubled and inspired them. Photography on this site by Mojtaba Moharrer, unless otherwise noted.